CENTER supports energising states of mindfulness and heart rejuvenation. Intentionally engage balance and self control to get you through difficult days. Quickly attain harmony between your thoughts and your emotions so you can enjoy this journey call life. 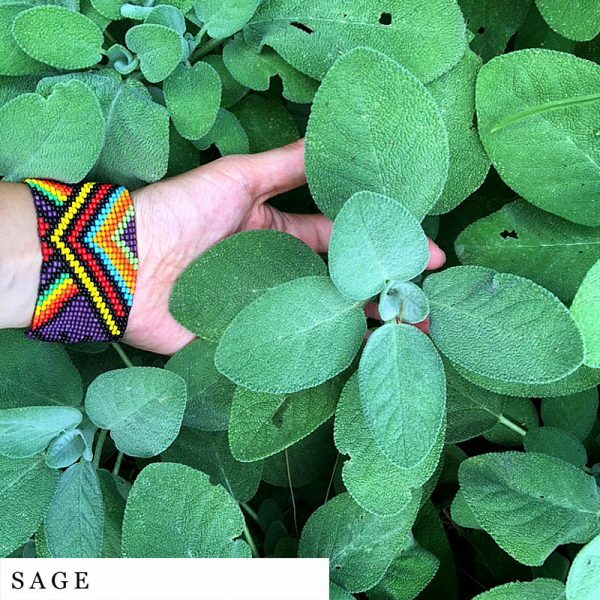 Sage -Salvia Officinalis- Used when a person faces a personal difficulty, specifically bad luck, as well as take away headaches, nosebleeds and sinus infections. 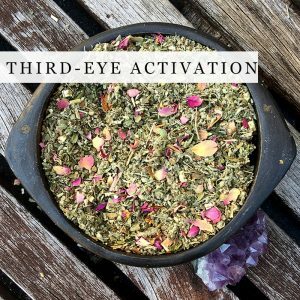 Also renowned for energetic purification as a smudge. Cornflower -Centaurea Cyanus- In Greek mythology, Achilles’ poisened wound was healed by applying cornflower plants since its rich in vitamin C and folic acid that helps detoxify the body. 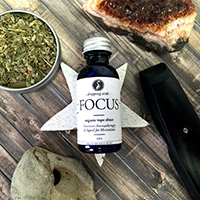 Energetic support for overcoming challenges. 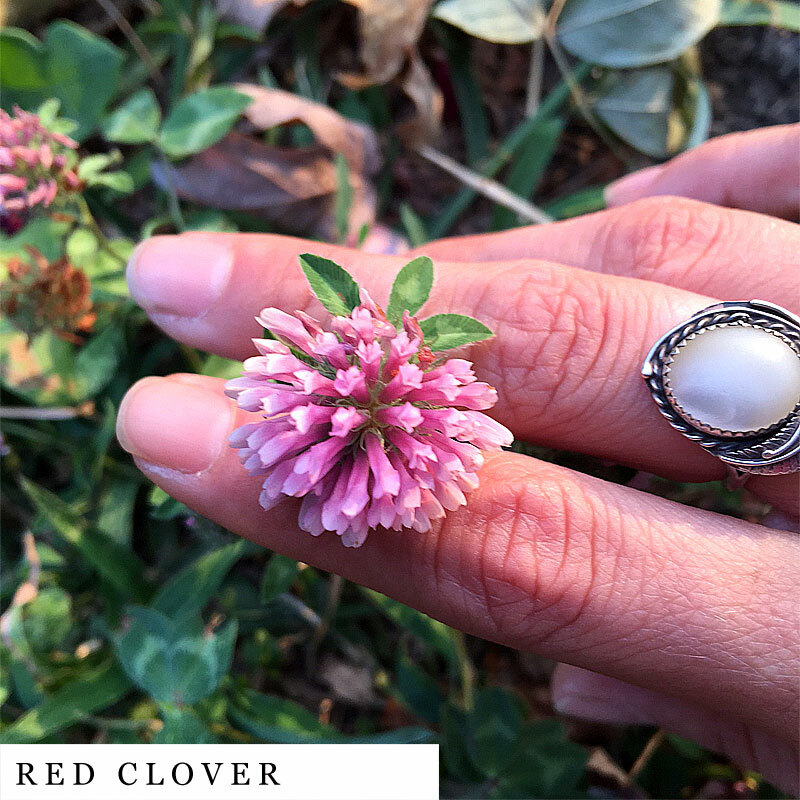 Red Clover -Trifolium Pratense- Assist the body in removing metabolic waste products along with it being filled with calcium, chromium, magnesium, niacin, phosphorus, potassium, thiamine, and vitamin C.
Calendula -Calendula officinalis- Boost the healing rate of wounds and brings comfort to those who are nervous, prone to fear & gone through a profound shock or trauma to the nervous system. Mullein -Verbascum Thapsus- Mild sedative and amazing lung healing herb when used as tea or herbal smoking blend. 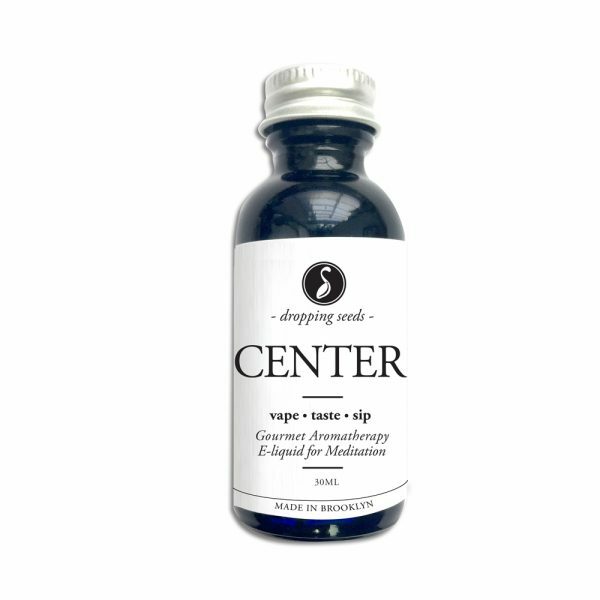 I absolutely love these products, the center vape juice I’d gotten is just wonderful. Will be buying again in the future! I wasn’t quite skeptical when I ordered this, but I was a little bit nervous I will admit. I had a few friends who tried it and they really enjoyed the flavor. 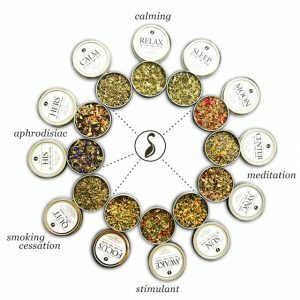 I have to say when I received my order, I made a glass of Center blend tea, and I rolled some of the Focus blend into a cigarette. I really enjoyed them both. What great flavor is they both have. I would recommend them both highly. 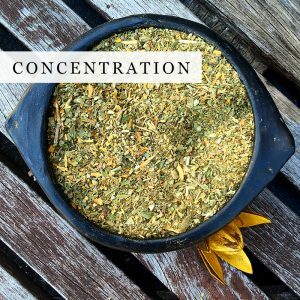 People who want to quit smoking, or just lessen the amount of tobacco they smoke can blend this for a really enjoyable flavor. Those who just want to smoke something but have it not be tobacco based will really enjoy this as well. I’m looking forward to trying new flavors. Thanks for making this stuff so easily accessible. 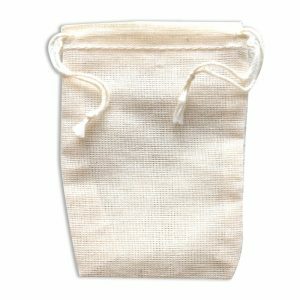 5 Stars for price, ease of ordering and quality of product. 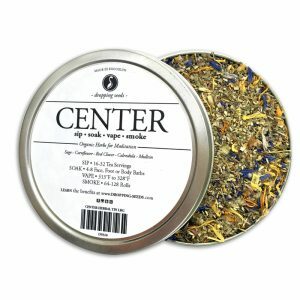 Just tried the Center blend for the first time and it is very helpful for anxiety. 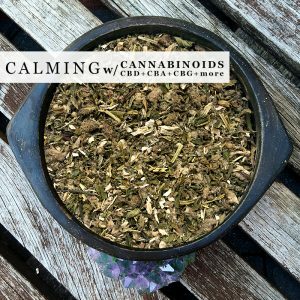 I was feeling quite anxious before I smoked a bowl of the herbal blend and within five minutes I feel more calm and relaxed. It has a wonderful scent and the hit is very gentle. 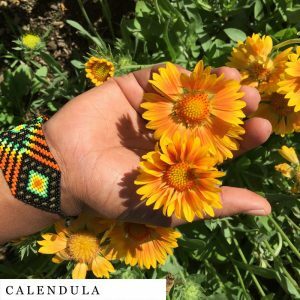 I can’t wait to purchase more products from this site! 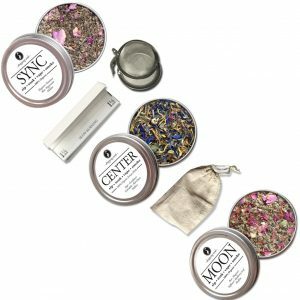 I absolutely love the CENTER herbal blend. It elevates the feelings in a room, but keeps me grounded in reality. It’s helped me clear my head on days when my mind is racing. It’s also so portable I can take it anywhere to share among friends! It smells great when smoked and it’s really pretty. Also a pinch goes a long way! I’m obsessed!! Just received my Center blend today! First, it smells truly incredible. I smoked a little bit of it just to try and it was a smooth, pretty hit. After finishing the bowl of just Center, I waited a few hours and then tried Center mixed with cannabis. That was truly something amazing, a really funky body high too. 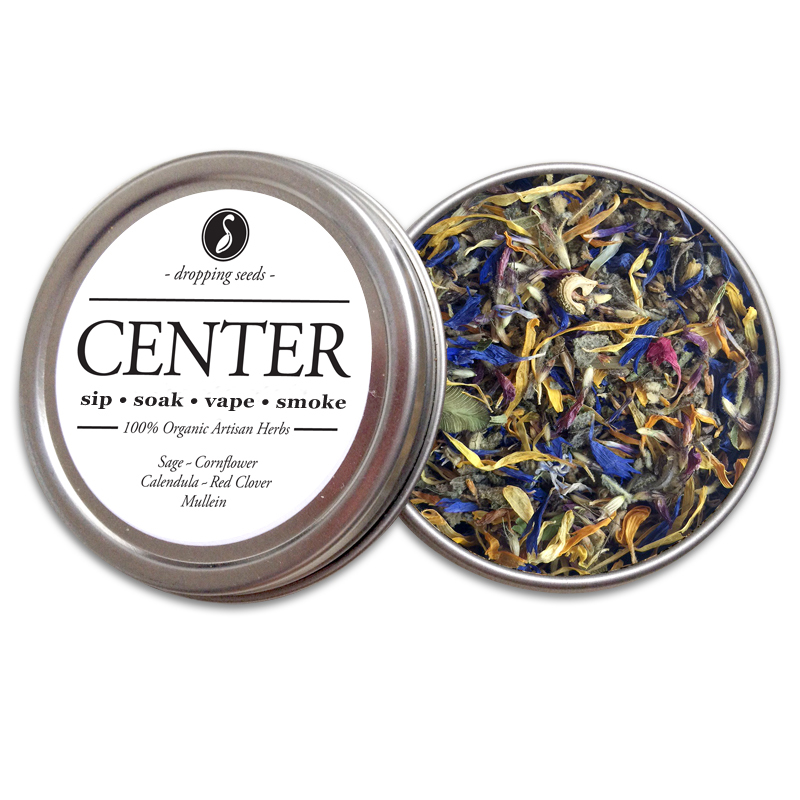 Now I’m enjoying Center as a tea and it’s really nice and floral-y. 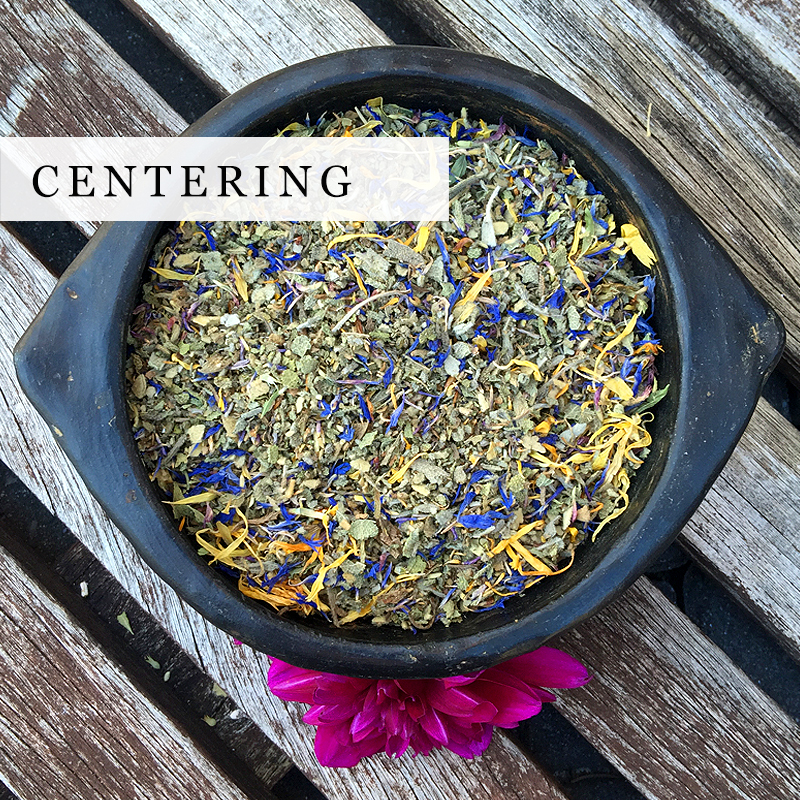 I’m excited to continue to explore Center as well as the other herbal blends! I love the center blend, my favorite so far. 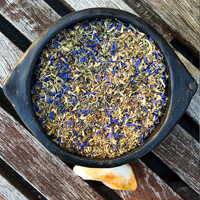 it smells lovely and as a tea it is EVERYTHING! Much better mood and subtle taste. Game changer for me. Excited to try other blends. I purchased a large tin of the Center herbs a short while ago and it’s great! 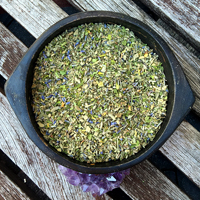 I mix it with other herbs, using Center as a base for smoking and the effects are quite calming. 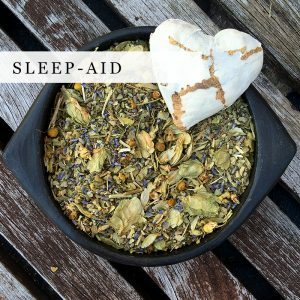 I’ve also used it as a tea and so far I am loving it! Can’t wait to try other varieties. 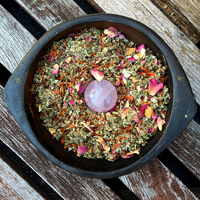 I love the blends I received! My favorites so far are the sync and center blends. Great product! I smoke it with an old clay tavern pipe. 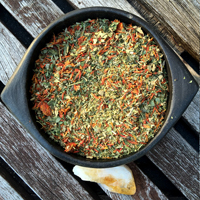 I get it moist by adding orange peel to small quantity of herbal mix before smoking it. 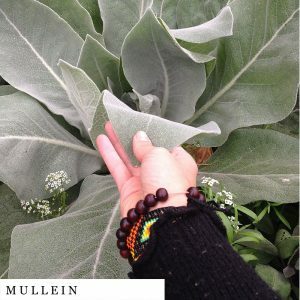 ~CENTER~ amazing product and I am quickly running out. 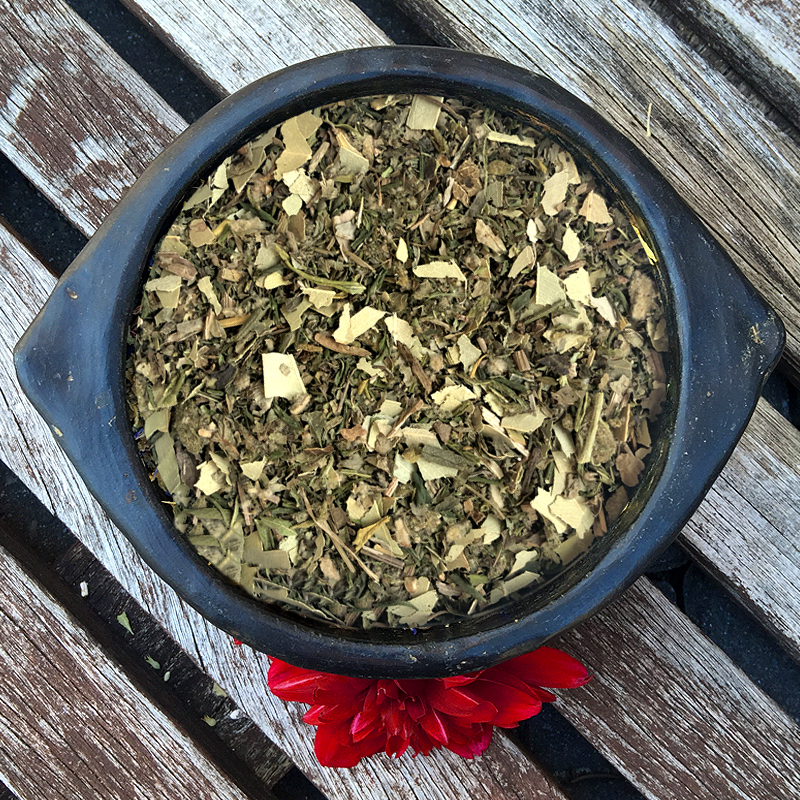 The taste and effects are calming and liberating and definitely magical. Thank you for your sharing. 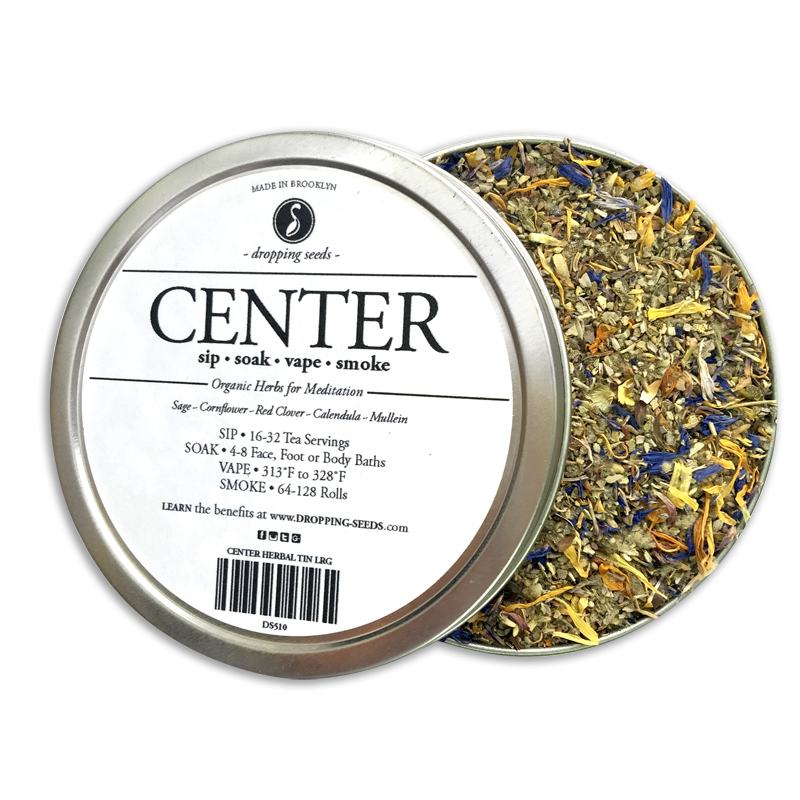 This center blend is great! 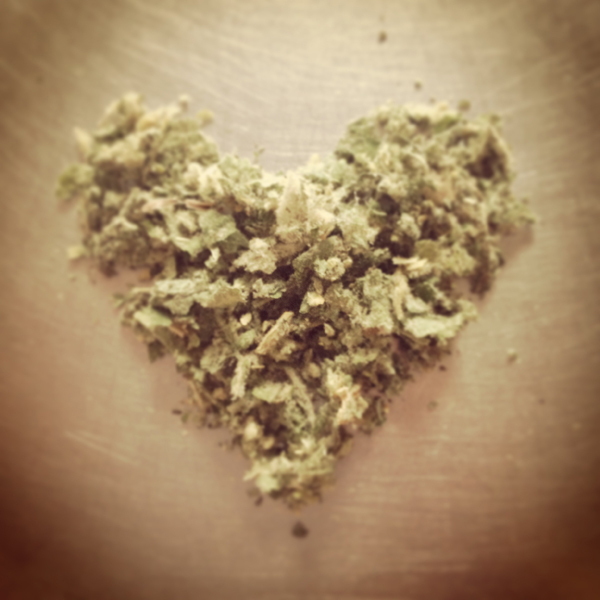 Calms me down when I feel overwhelmed, no bad taste, and don’t stick to my cloths if I smoke it. Thanks so much for a quality product. I purchased the center blend for my mother. She absolutely loves it! She vapes it and makes a tea. 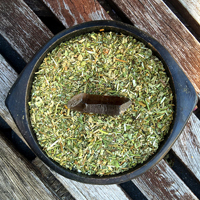 Now my entire family is drawn to the different herbal blends and their benefits. Was not sure what I was getting into with the Center blend. 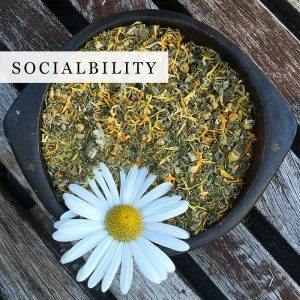 Once I started using it as tea on days that my anxiety took over, I found myself being less negative and more relaxed. 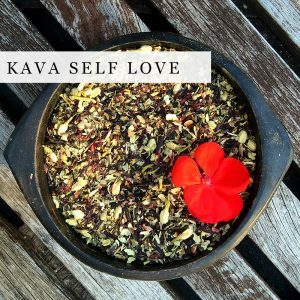 It helped stop my mind from racing away with toxic thoughts. Thank you for this great offering. CENTER was conceived when we took a cross country trip from NYC to CALIFORNIA. Not only was it during Mercury Retrograde but we truly did not know what it took to keep a toddler entertained for 3000 miles and we were also pregnant with our second child. Needless to say, CENTER kept us from getting to stuck with worry and planning but kept our hearts filled with enough happiness to enjoy the changing scenery.